Warner Bros. rolled out a bit of new Godzilla footage at CinemaCon. They didn't reveal a ton of new things that weren't already released online, except for Godzilla. And we learned a lot more about why Bryan Cranston is so very pissed off. Gareth Edwards took the stage in Las Vegas, saying that he had just finished the edit to Godzilla yesterday. He then sheepishly said that while he is up presenting the movie, it really was a team sport and that in May they will all get Godzilla across the finish line, and it will be "OK." And then he paused to correct himself for saying "OK" because the studio execs hate that. Edwards then showed a bit of footage from the finished film. Some we have seen before — but the big reveal in this clip collection was all about the character Bryan Cranston plays. 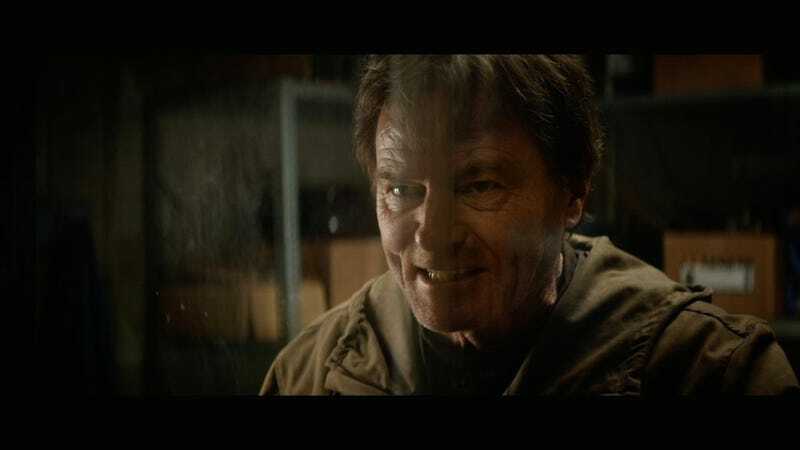 In a previous trailer, we saw Cranston losing his mind and screaming, " "You are not fooling anybody when you say that what happened was a natural disaster. You're LYING. It was not an earthquake. It wasn't a typhoon...."" But why was he saying this? Well, now we know. Spoilers ahead. Turns out Joe Brody (Cranston's character) works with his wife (played by Juliette Binoche) in a Nuclear Power Plant. In the footage we saw, it's revealed that something happens — a massive earthquake-like disaster, that causes the plant to melt down. Cranston flips out, and runs to the door that locks, trapping the people inside the plant. Of course his wife is trapped in this plant. He's standing at the door screaming when a cloud of pink smoke starts rolling down the hall. He screams and closes the door. Minutes later, Juliette Binoche appears. Cranston is heartbroken. He flips out in front of his (presumably) slowly dying wife. We assume she doesn't make it. Cut to Cranston talking with Aaron Taylor-Johnson (who plays Ford Brody). He tells Aaron that he did all he could to help save her? Is Cranston talking about their mother? Are these two father and son? You can also tell that Cranston has been quarantined behind a glass wall. This is his warning to his presumed son. And we move on to the character Elizabeth Olsen, who plays Elle Brody. Clearly this family is husband and wife, and son and wife. Olsen is in scrubs on the street looking up into the sky as the world crashes down around her. She's holding a baby. Cut to Aaron Taylor-Johnson sitting in an airplane as one of the first responder paratroopers who literally jump onto Godzilla as the Kaiju emerges from the ocean. He's holding a picture of his wife and child (Olsen and the baby). Cranston's voiceover rages, warning his son that the government has been lying to him. But it looks like he's about to find out for himself soon enough (with the death defying jump). So it looks as though we're going to see this entire monster movie through the eyes of the Brody family. Good thing that they all just so happen to have jobs that are all directly related to a Kaiju attack. So there will be no lack of action while we're hashing out Brody drama. Can't wait to see more.